You know, most everyone knows who Flogging Molly are, and why shouldn’t they? Granted, they weren’t the first to infuse the punk aesthetic with tin whistles, violins, and accordions—bands like The Tossers, The Mahones and The Real McKenzies had already charged up their Irish pub sound with an aggressive punk rock vibe years before Flogging Molly had formed. While they didn’t exactly invent the alleged Celtic punk genre, they perfected it by writing songs that were catchier with their vocal and musical melodies with deep, poetic and often very grim lyrics which absolved them of being pigeonholed as a Celtic punk act and rather as a band whose sound is simply defined as themselves. 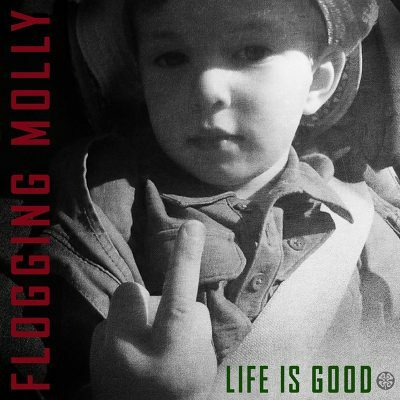 For me, there is no bad Flogging Molly album, just albums that I like more than others. I love their first two albums Swagger (2000) and Drunken Lullabies (2002) with their mix of party-hearty drinking anthems and lead singer Dave King’s tributes to his parents and tales of living in exile whilst in the United States. I loved the somewhat darker, more socio-political themes from Float (2008) and Speed of Darkness  that came as a result of my favorite album Within a Mile of Home (2004), which I feel is still the best representation of Flogging Molly as it holds an even mix of all the aforementioned thematic elements. Naturally, there’s very little this band can do to disappoint me (unless they stopped making music altogether), so I was excited to hear how their first album in six years was going to sound. I had already been given a taste of it with the teaser tracks floating around the internet, but this was the first time I would hear Life is Good in its entirety. The album opens up with “There’s Nothing Left Pt. 1”—arguably the first proper Flogging Molly intro track with its straight up Irish folk approach focusing on building up their sound rather than jumping right into it. Then, Flogging Molly’s signature sound comes in with “The Hand of John L. Sullivan,” which tells a story of a man by the name of Jim Casey who liked to shake hands with the boxing champion. “Guns of Jericho” is more somber with Matt Hensley’s accordion and Bridget Reagan’s fiddle carrying the melodies front and center while “Crushed (Hostile Nations)” is one heavy scorcher with Dennis Casey’s power chords exploding in every chorus—while stylistically different, both represent brutal portrayals of the turmoil in our current global situation. “Reptiles (We Woke Up)” builds upon itself with each instrument coming in between a rallying, chant-heavy chorus instilling the message of optimism with its lyrics, giving me goosebumps in the process. The title track carries on that same message while also touching on the anomaly that even in its most painful moments, life, indeed, is still good.